Great debut that finds the band sounding a little bit like Van Halen sometimes (Nuno on “Teacher’s Pet” and “Play With Me”), though songs like “Mutha (Don’t Wanna Go To School Today)” and “Rock A Bye Bye” are pure Extreme classics. 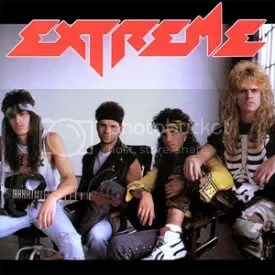 The album cover is pretty striking, because if you didn’t know who Extreme was, you’d think they were just another hair metal band — but they’re actually far from that. The album has two truly outstanding tracks for me – “Rock A Bye Bye”, which is the usual beautiful Extreme ballad and then “Play With Me” which I think it one of the greatest hard rock songs to come out of the ’80s and it immediately put Nuno Bettencourt on the map as a guitar hero (in fact, the song has been included in the Guitar Hero video game series!). Besides Nuno’s guitar work, Gary Cherone is another bright spot. He’s always brought loads of personality to Extreme and it all started here (and of course, the backing vocals in general are great as well). This one can be found new ‘n’ cheap and it’s definitely worth the investment. AKA – Extreme II: Pornograffitti. Great album. 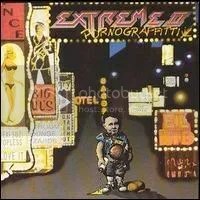 Extreme were a band I originally had a hard time getting into outside of the mega hits “More Than Words” and “Hole Hearted”. Upon first listen, this album was just too much funk metal for me, but now I’ve seen the error of my ways. 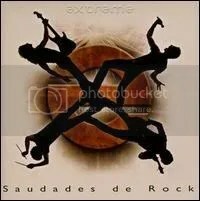 Funny enough, I felt the opposite about 2008’s Saudades de Rock… which didn’t have *enough* funk metal! So besides the two previous mentioned songs (which didn’t really represent the band’s overall style accurately), there’s a number of monsters here. “Get the Funk Out” is probably my favorite Extreme song, it’s so big and bombastic and catchy. I love it. Check out “He-Man Woman Hater” for some great work from Nuno. Am I the only one who really wants to cut that strap off Gary or at least pull the other one back up? Wow! Fantastic album. And I’m not a big Extreme fan. I own Pornograffitti and I don’t really care for it, so I wasn’t expecting much here (especially since I don’t like the lead single “Star”), but what a surprise. This album is great. The songs and production is just spectacular. There’s a bit too many mellow songs here, but that’s nitpicking because even those are done extremely (HA! Get it?) well. “King of the Ladies” is a great rocker and as I say alot when veteran acts release new albums, if it wasn’t for Extreme being considered a so-called “80s band”, it would probably get a lot of airplay. Same goes for “Ghost”, which sounds like something Coldplay will do. But the band doesn’t come off as sounding forced modern rock, this is still an album for Extreme fans with an Extreme sound and I don’t see how anyone who digs their hard rock/funk style could be disappointed with “Slide”, which is arguably the album’s most energetic song. This album leaves me thinking perhaps I should give Pornograffitti and the rest of their catalog a second chance.